The Songkran Festival is also known as the traditional Thai New Year or the Thailand Water Festival. The Songkran 2019 festival will take place April 12th through to the 15th. The word Songkran translates as 'the passing of'. 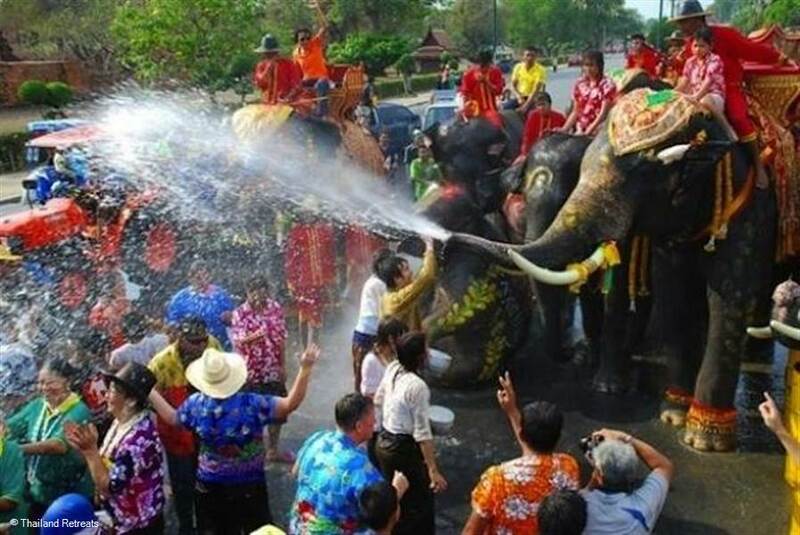 The traditional celebrations involve Thai people sprinkling water on their family members and revered elders for good fortune, to show respect and receive their blessing. Homes, gardens and images of Buddha are given a good clean during this time. Many towns and cities will parade images from local wats in the streets. Water and jasmine flowers will be thrown over the images to pay respect to Buddha. People will also prepare food to give to monks and temples for merit making. Today though, the tradition has evolved into a large nationwide festival involving huge water fights. If you are visiting Thailand during Songkran, prepare to get soaked. You'll feel like a kid again as you get involved with water fights between locals and visitors alike. Expect buckets of water, water hoses and super soakers. Locals will gather in the streets all across Thailand. The celebration is all in good fun and takes place during one of the hottest times in the year -- so a great time for water play. The water used in the festival is said to wash away bad luck. The rules are to play nicely and don't get cross. You'll also find that firecrackers are sometimes lit during this time, they are said to ward off evil spirits. As well as water you may find some of the buckets include ice or coloured powder. If you are going to get involved, stay alert and don't wear your best clothes! Songkran can bring an amazing sense of excitement and fun for children of all ages. In some areas, the festival will also have shows and entertainment specifically for children. However, some of the celebrations do get quite rowdy and may not be family friendly. In Koh Samui, Maenam is a good quiet location to celebrate, but you might want to avoid Chaweng at this time. Patong will be very busy especially around Bangla road -- the morning festival in Phuket Town is gentler. There will be lots of traffic on the road during Songkran -- a journey that usually takes twenty minutes could take several hours. We don't advise you to travel via road during this time. Road safety is also an issue. Road accident statistics increase during the festival and water fights from the rear of pick up trucks are now against the law. Staying in a Hotel or Villa? Several hotels and resorts will have their own celebrations -- this may involve a traditional Thai blessing where staff and guests sprinkle water on elders or Buddha statues. It may also involve a special meal and celebrations like Thai dancing or tug of war and possible water wars! If you are staying in one of Thailand Retreats villas with a private chef, you can request a special meal and take cover from the water fights if you choose to...as you cant go anywher much on the 13th April with the roads gridlocked!